Ionized Water is produced through a process called electrolysis – where electric current is passed through the water to separate water into oxygen and hydrogen gas (or positive and negative ions). 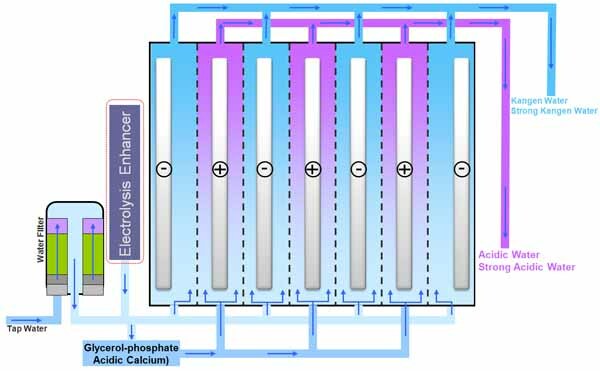 The electrolysis takes place in the electrolysis chamber containing oppositely charged electrode plates. The result is a collection of positive H+ ions and negative OH- ions ready to neutralize any free radical in your body. Replaces soluble acids in your drinking water with trace minerals, calcium, potassium, magnesium, and sodium. Turns your drinking water into great tasting alkaline water. Reduces the electron millivolt (mV) charge of your water which creates -ORP or negative oxidation-reduction potential. This turns your water into the highest antioxidant liquid on the planet. Breaks large water clusters into smaller clusters or “micro-clusters” (4 – 6 molecules per cluster) which increases hydration of your body. Aids in the displacement of acids through urination, sweat, and other normal channels of elimination through your kidneys, bowel, lymph and skin. Works to turn your body into an alkaline state where sickness and diseases cannot thrive in. The health benefits of ionized alkaline water are discussed in the following article Alkaline Water Health Benefits.